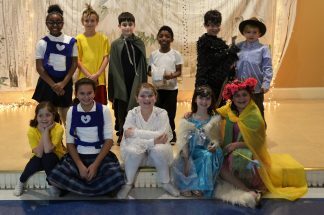 Boston Community Collaborative’s recent performance of “12 Months with the Snow Queen” at St. John School. Boston Community Collaborative has released their January 2018 session details for classes offered in the North End for school-aged children. See details below. At the Eliot School (open to all – if your child attends a school other than the Eliot, we will work out details individually). The start date is January 8. No class on 1/15/18, or 2/19/18, end date is 3/19/18. Performances will be March 18 at 2pm, March 19 at ~3:30pm at North End Library, and Date TBD for the in-school performance at the Eliot School (if your child is not an Eliot student – no worries, we’ll figure it out). For 9 weeks the cost is $150/child/offering. Pick up/drop off to North End locations possible – may include additional, but small fee. Grades 3 and 4 will rehearse 3pm – 4:15pm; Grades 5-8, 3pm – 5pm. At St. John School (open to all SJS families, and takes place at SJS during after school program). The start date is January 3rd. No class on 2/21/18; end date is 3/14/18. For 10 weeks the cost is $165/child/offering (same price per week as last session). At St. John School (open to all SJS families, and takes place at SJS during after school program). The start date is January 4th. No class on 2/22/18; end date is 3/15/18. The performance will be March 18 at 2pm. At St. John School (open to all SJS families, and takes place at SJS during after school program). The start date is January 5th. No class on 2/23/18; end date is 3/16/18. Sibling discount applies! If this applies to your family, please let Becca know and she will get you the details. If your Grade 1 and up child is NOT in the afterschool program, we do our best to work out details. There are a couple of options – email Becca to discuss. Up Next: Mini Musicals! Abridged Classics of Stage and Screen. Students will perform miniature versions of well-known Broadway and Hollywood musicals such as Newsies, Singing the the Rain, Wicked, and many more. Performance Date for all of our dance and drama students is Sunday, March 18th at 2pm. If you are interested in our offerings this session and are a returning student, just say so! Drama on Mondays (At Eliot)? Fitness on Wednesdays (at SJS)? Drama on Thursdays (at SJS)? Dance on Fridays (at SJS)? If SJS, is your child in the After School Program? Will you pay by check or credit card? In addition, Boston Community Collaborative will again teach “Engineering for Kids” to SJS after school kids grades 1 and up, starting in January. This is paid for and provided by the SJS afterschool program.